You will get kitchen decorating and backsplash ideas at Tile Art Mosaic. We specialize in custom designed handmade tile for mosaic kitchen backsplash, bar backsplash or tile art kitchen accents. 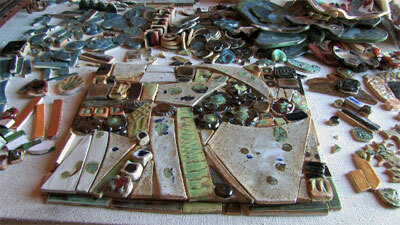 Vickie will work with you and your design ideas to create a one of a kind tile art mosaic for you and/or your client. Kitchen decorating ideas include custom backsplash tile designs, mosaic tile art, handmade tile accents to custom ceramic tile kitchen backsplash mosaic murals. 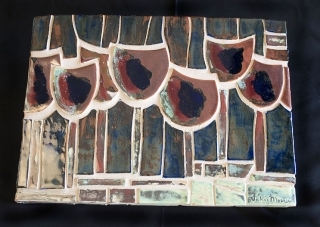 All art tile mosaic kitchen backsplash designs are custom and hand made by the artist, Vickie Morrow. Vickie will work with you and your decorating ideas to create a one of a kind kitchen interior. You may only want a custom tile mural or tile accent over the range or surrounding the kitchen window or the backsplash on an isolated kitchen counter or bar backsplash for your kitchen remodel, we can do it. See handmade tile kitchen backsplash mosaic pictures here. Decorative bathroom wall tile is a great way to add character and elegance to your bathroom decorating. Create a tile focal point over your bathtub with a custom designed mosaic tile inset or handmade mosaic medallion. Click here for Bathroom Mosaic pictures. Fine art made with custom made tiles, born simply from Vickie’s imagination. From functional items like trays or mirror frames to fanciful pieces of artwork, each is unique and a one of kind item. Many of Vickie’s ideas for her fine art pieces occur to her as she’s out and about in the world. She’s a visual person, so everything she sees, she now sees in mosaics. A scene at the park, the way a table may lean… anything can spark her. Sometimes its as simple as rolling out and glazing random pieces, then seeing how they might fit together. No matter how she goes about it, she loves to turn out unique and beautiful art. See her mosaic art collection here.